With spring approaching, it’s important to add fresh stimulus to your living space. While this can be as simple as buying a new wall hanging or rearranging the furniture, I decided to improve my home computing space to make it ergonomic, space efficient, and flexible. One way to edge closer to tech Feng Shui is to try Ergotech’s flexible mounting systems. I tried the VersaStand ($79) for iPad and the Freedom Arm ($159) monitor mount with an articulating arm you can attach to the side of your desk. Mounting my various screens moved them up and off my desk, giving me room to work, and the option to pull them close and move them as necessary. The iPad VersaStand is a sturdy, well-made, and flexible standalone mount/case for the iPad. The mount kit includes a quality Smart Cover with a special clip on the back that makes it easy to snap the iPad on and off of the mount. No tools are needed for this installation. Just pop your iPad into the case, and snap it on! 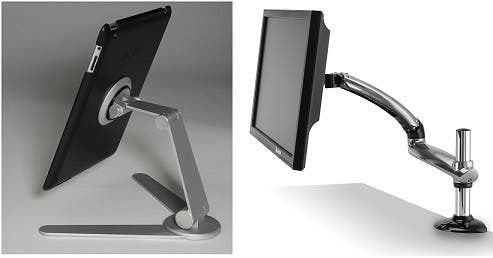 When mounted, you can swivel and adjust the iPad to a variety of angles and orientations. The base cleverly folds in and out like a grasshopper, making it especially portable. For my desktop monitor, I have been looking for a somewhat affordable mount for a long time. Many professional models are just too expensive and not practical for my purposes. I have a small desk space — a cheap old IKEA desk I inherited when my daughter left the nest years ago. While perfect for the small computer space I inhabit, my 24" monitor, iPad, and other gadgets left me with no desk space remaining. ...after Ergotech, my monitor is out of the way! Although the arm wasn't exactly easy to install on my little IKEA desk, once mounted, it made a world of difference (now my wife wants one for her office space too). With some minor desk modifications, I was able to achieve flexible monitor nirvana. Here's how I did it, using the included adjustment tools and my Leatherman! When I received the Freedom Arm kit, I realized it would be a pain to install with my desk judging from the size and heft of the base. My desk has no substantial edges to attach to, and the arm needs to mount to the side of the desk using a bulky, vice-like attachment. The base and arm of the mount are solidly made, and the rather thin piece of pressboard that makes up the top of the desk would not be substantial enough. I was going to have to modify the desk — i.e. make a hole in it — Ruh, Roh! When I say something casual to my wife like, "Oh, by the way, I need to make a hole in my desk," she usually starts looking online immediately for something to replace the object I’m about to destroy. It's not that I am a total non-craftsman, but she knows two very important things about me: one, I’m impatient, and two, I find "creative" ways to fix things after I ruin them. Since my neighbor (who has a good assortment of tools) wasn't home, I used my Leatherman's small saw-like attachment insted. While you're probably wondering if this story will end in the emergency room or at the furniture store, the result was better than expected. To summarize, I simply removed the desktop surface piece from my IKEA desk, and using the small saw attachment, carved out a groove deep enough that I could effectively attach the mounting base flush with the back piece of the desk (in the center of the desktop). I then secured the mounting base to the desktop piece before re-attaching it to the desk. With the base mounted, I then screwed in a few pressure screws to the arm unit, and mounted the arm on the base. Next I removed my monitor from its base and mounted it to the arm's mounting plate. You should verify that your monitor has the proper VESA screw holes on the back, before splurging on an arm like this. The monitor arm has an adjustment tool for ratcheting the tension to your desired ease of motion. Adjust the tension on the pressure screws and the arm spring to lock the arm at a certain level or orientation. Last I routed my monitor cables into the cable clips along the underside of the arm. So now I've finished my workspace rearrangement project and the result is flexible, ergonomic, and functional. The monitor mounts are actually very easy to install (unless you have a desk like mine, but even then it only took an hour or so to modify). Both the VerstaStand and Freedom Arm are quality products in my opinion, and I rate them highly compared to similar gear I’ve used in the past. So, how do you plan on updating your computing space this year? Let me know how your own project goes!